I love meatballs. 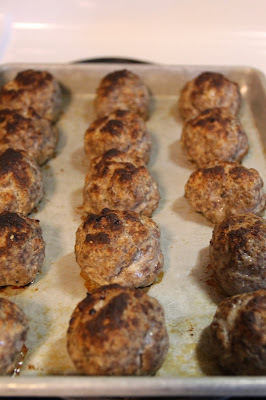 Regular meatballs, spicy meatballs, or turkey meatballs--if it's meat in the shape of a ball, it's for me, plain and simple. So for a while now, I've been brewing this recipe in my head to make ricotta meatballs. I mean, who in their right mind doesn't love cheese and meat all together in one great bite? Crazy people, that's who. I only had one problem: morning sickness. It was keeping me from wanting anything to do with the cooking end of my kitchen for about a month. It was a dark month filled with *gasp* ramen noodles and caesar salads and apples. I would honestly like to never again speak of this, but it's not like I have to be ashamed...I'm growing a human here, and it gets a little strange sometimes. Anyway, now that I am officially out of that god-awful phase, I have been getting back in the kitchen and the first order of business was making some meatballs! This is a very simple meatball, I assure you. Simple is good. Simple is great, actually. Simple round-up of ingredients here: a pound of ground meat (I used venison, but you can use beef or turkey or whatever you fancy! ), 1 egg, 2 cloves garlic, ricotta cheese, bread crumbs, cayenne pepper, oregano, salt and pepper. Basically you are going to throw all these ingredients into a medium bowl and then you are going to remove your wedding rings. Or any rings that you may be wearing. Because the only way (I repeat ONLY WAY) to properly mix a good meatball is with your hands. Your. Bare. Hands. Mix it up. Now, normally I would put down some parchment paper on my pan, but I was out and so I just greased my pan instead. Do what you will. Now make your meatballs into nice rounds and lay them out on your pan. I like mine about the size of my palm. I always take a nice picture to give you perspective. But this is my personal preference. Heck, you can make these suckers the size of softballs if you want. Then, I popped them into the oven on HIGH BROIL for 12 minutes. This gives them a nice brown and I think it helps them to stay together. If you want to talk about this further: I know that some people (eh-hem, some people in my family) like to fry their meatballs, which gives the same effect. However, my thing is, the less I can move these meatballs around, the better. Plus, this does them all in one shot which is generally easier for me. One more thing: when I pulled these out of the oven, I got a big whiff of them and it was GLORIOUS! To me, these smell like Christmas, which I guess means that I think they smell like love and family. I feel all warm and fuzzy. Next? Pop them into a big old pot of pasta sauce. I used a recipe of THE Marinara Sauce but I want to also note that I used my home canned tomatoes, not store bought. You can use canned sauce, too--no shame and NO judgments!!! I served mine with rigatoni. Seriously though, is it just me or does anyone else love shaped pasta?! I just feel like it tastes so good. Because of the shape, obviously. Time: 1 hr | Makes 15 meatballs | Difficulty: Easy! Combine the meat, egg, garlic, ricotta, breadcrumbs, oregano, salt and pepper in a medium bowl. Remember to take of your rings. Mix it up reeeeeaaaaalllllly well with your hands. Do not use a spoon. Only with your hands. Grease a pan or line it with parchment paper. Roll that nicely mixed meatball meat into palm-sized rounds, and place them on your greased pan. You should get about 15. Place your meatballs in the oven on a high broil for 12 minutes. Get a pan of sauce heating on the stove if you haven't already. When the meatballs are done in the oven, they should have a nice crisp layer on top and smell delicious. Plop them into your sauce and allow them to simmer for about 40 minutes or until you are ready to serve. Serve over your favorite pasta with parmesan cheese on top!!! !